The Circles Neighborhood is located on the west side of Santa Cruz.It is accessed primarily from California Avenue off of Bay and from Woodrow Avenue. Read more about "The Circles" neighborhood and see homes for sale in west Santa Cruz, below. 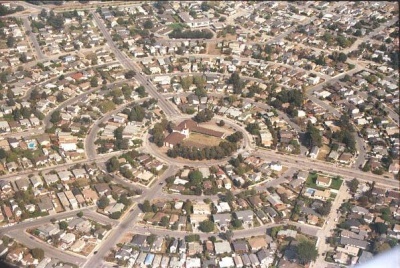 The Circles neighborhood in Santa Cruz is occasionally called Garfield Park. There is a small library there that appears to be from Andrew Carnegie's efforts. Most though call this area "The Circles" from the obvious geography of the layout of the streets that is unique to the county. In its long and varied history, Santa Cruz, CA has been many things to many people. Beginning with the founding of the city in 1796 that joined a Spanish Catholic mission and a military garrison, the city has played host and home to a unique array of adventurers, immigrants, and those simply seeking the multifaceted beauty of this central CA coast city. Its central state location, in fact, had a great deal to do with its choice as a state convention meeting location for religious groups. In 1875, the Methodists established Pacific Grove as a religious retreat and the site of their state conventions. Based on the success of the Methodists’ Pacific Grove community, Santa Cruz began inviting different religious groups to build retreats in the area, even offering a $3000 incentive. In 1887, the Christian Church/Disciples of Christ purchased 10 acres of land and built what is now called the Circles, a quaint neighborhood of Santa Cruz homes and its historic church. As its name implies, the Circles Santa Cruz neighborhood is laid out in a series of concentric circular streets where church members were invited to build tents and summer cottages. At the hub of the streets, a large tabernacle built in 1890 dominated the area. With its 100-foot bell tower, 3,000-seat hall, and large perimeter doors, the tabernacle more than earned its nickname – The Ark. The entire retreat was initially called Garfield Park in honor of U.S. president James Garfield, who was also a pastor in this Christian denomination. One of the main thoroughfares was also named Garfield Street, later becoming Woodrow Street. 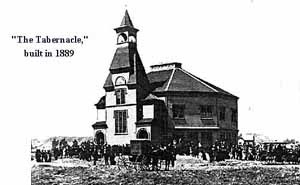 In 1935, a fire destroyed the old tabernacle. A new church was dedicated in 1959 and remains today. The previously named Garfield Park Christian Church became the Circle Church in 2007. The spoke in this picture in the top is California Avenue, the right is Woodrow Avenue, and the bottom is Younglove. The inner circle is Erret, followed by Wilkes, Walk, and Dufour.The big church burned down and the Spanish style building is what you see now. During its early years, tent homes were common in the Circles Santa Cruz neighborhood. Constructed of wood half-walls or wainscoting, the upper walls and roofs were canvas tenting. Later, more permanent materials were used, but the small footprint of the buildings remained, along with the narrow lots on which they sat. This cozy layout made these Santa Cruz homes pedestrian-friendly, with residents within easy walking distance of the church and other residents. The circles lots are often between 2000 and 3000 square feet in size, while a standard city lot is usually 5-6000. The original planned Santa Cruz homes community didn’t flourish quite as expected. However, the Circles Santa Cruz neighborhood has remained vibrant through the years. Many of the houses in the Circles Santa Cruz neighborhood were not built until after World War II where it became the center of Santa Cruz’s African American community. Today that is not so much the case. Today, the Circles Santa Cruz neighborhood is still known for the intimacy of times past. While these Santa Cruz homes are on the smaller side, the heart of the Circles Santa Cruz neighborhood remains as large as ever. Friendly small corner markets are reminiscent of times when a trip to the market was a daily routine and neighbors were closer not only in proximity, but also in spirit. If you are thinking of buying a home on the west side of Santa Cruz, "the circles" are an affordable place to start. Search for all Santa Cruz homes and see what is the best neighborhood for you. Read about other things or happenings in Santa Cruz real estate on my other blog.